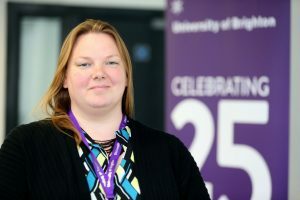 On 28th April Brighton Business School hosted a 25th anniversary gathering. Over 100 staff, students and alumni attended the event which took place in Mithras House. The day began with a keynote speech by Business Studies with Finance alumna Laura Carlton (Director of Commercial Credit Integration at American Express). Laura reflected on the changes and innovations in the business world. This was followed by a panel discussion. 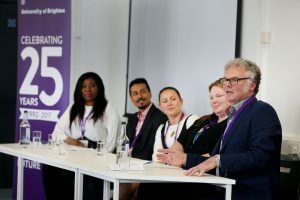 The panel was chaired by Peter McCullen (Deputy Head of Brighton Business School (Quality)). They discussed important changes in different areas of business. There was a focus on innovation in technology which now allows organisations to run more smoothly and internationally and also discussion about constantly learning and testing new ideas. Audrey was able to take part in the discussion from the perspective of a current student which created an interesting contrast with the graduates who are all working in industry. After the panel discussion, guests had the opportunity to choose their next activity. They could try their hand investing in the stock market in the trading room. If they wanted some relaxation, they could attend Aroma Chillax with Zoe Swan (Law Course Leader) where they had the chance to support their well-being with pure oils, self-massage and guided relaxation. 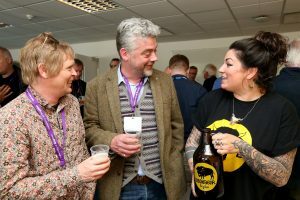 For the beer enthusiasts there was Craft beer tasting from Bison Beer and Sussex cheese to compliment it. The students who attended the event then had the opportunity to speed network with alumni for half an hour before everyone took a coach to Brighton Museum for the evening reception. 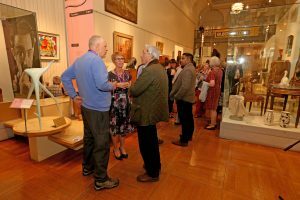 At this point guests had a quick introduction from museum staff and then the opportunity to explore the exhibits as they wished. Alumni, staff and students had a great time at the event and there was a wonderful celebratory atmosphere to mark 25 years since Brighton achieved university status.